The president of Adhaalath Party, Sheikh Imran Abdulla, has appealed a criminal court ruling to keep him in police custody until the end of a terrorism trial. Imran is charged with terrorism along with Jumhooree Party’s deputy leader Ameen Ibrahim and its council member Sobah Rasheed. The three are accused of inciting violence at a historic antigovernment protest on May 1. At the case’s first hearing on Tuesday, state prosecutors cited a secret police intelligence report, and claimed Imran was a threat to society. 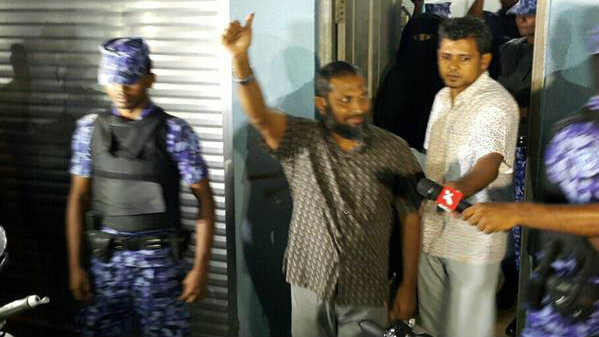 They requested the three-judge panel detain Imran until the end of his trial. Defence lawyers requested Imran be kept under house arrest, noting the high court had last week overturned a May 17 criminal court order and transferred Imran from police custody to house arrest because of his diabetes. President Abdulla Yameen has vowed to file criminal charges against an opposition leader who had implicated the president in the 2012 murder of MP Afrasheem Ali. Several defectors from the ruling coalition, including Adhaalath Party president Sheikh Imran Abdulla, have said that the president and the tourism minister Ahmed Adeeb know the truth behind the brutal murder. “I am being accused falsely. This government will penalise them. I want to file charges against those who are making these accusations. Not that of defamation, but criminal charges. I will file charges against Sheikh Imran,” President Yameen said at a ceremony to open a domestic airport at Raa Atoll Ifuru. Afrasheem, an MP for the Progressive Party of the Maldives (PPM) representing Ungoofaaru constituency in Raa Atoll and also a moderate religious scholar, was stabbed to death outside his home on the night of October 1, 2012. Police had said the killing was politically motivated. President Yameen said the government will build an Islamic Centre on Ungoofaaru in Afrasheem’s memory. Hussain Humam, the chief suspect in the murder and the only person convicted of the crime so far, has alleged the president and the tourism minister’s involvement in the killing. At the first hearing of his appeal at the High Court in April, Human, who was sentenced to death in January 2014, said the pair “will know best” the details of the crime. The home minister, Umar Naseer, was the first to link Afrasheem’s murder with President Yameen. Speaking at a public rally after he lost the PPM’s 2013 presidential primaries, Naseer accused Yameen of having illicit connections with gangs, the drug trade and said he had witnessed a visit to Yameen at the PPM’s office by a suspect who was arrested and questioned by the police over the MP’s murder. He retracted the allegations when he joined the cabinet. The Maldives decriminalised defamation in 2009. The parliament then set the maximum penalty for civil lawsuits against slander at MVR5,000 (US$325). The Prosecutor General Muhthaz Muhsin last week said his office is looking into what sort of criminal charges could be filed over the allegations against the president and the tourism minister. 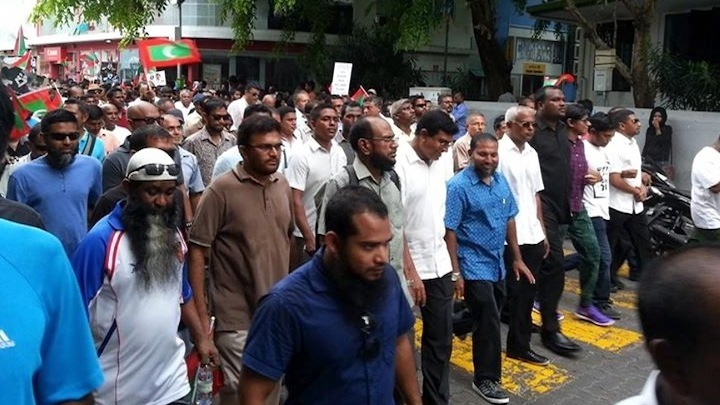 Several politicians, including ex-PPM MP Ahmed Mahloof and ex-police chief Abdulla Riyaz, revived claims of links between Afrasheem’s murderers and President Yameen after joining a campaign against government authoritarianism. The president’s half-brother, former president Maumoon Abdul Gayoom, sued a newspaper editor in 2011 for re-publishing a New York Times article on misuse of state funds revealed in a 2008 audit report. He lost the case, but successfully sued the late historian Ahmed Shafeeq over claims that 111 people had been killed in police custody during Gayoom’s 30-year reign. Imprisoned ex-president Mohamed Nasheed has recently said he will sue four judges of the Criminal Court over claims made regarding his terrorism trial, in which he was sentenced to 13 years in jail. The High Court has upheld the criminal court’s order to hold Adhaalath Party leader Sheikh Imran Abdulla and main opposition Maldivian Democratic Party chairperson Ali Waheed in remand detention for 15 days. However, the appellate court has released Jumhooree Party deputy leader Ameen Ibrahim from police custody, overturning the criminal court’s 15-day remand order. The three leaders of the allied opposition parties were arrested from their homes with court warrants on the night of May 1. All three subsequently filed appeals at the high court challenging the legality of the criminal court’s remand detention orders. The arrests followed a crackdown on the May Day anti-government demonstration. Nearly 200 people were arrested after protesters clashed with riot police. The opposition leaders were accused of inciting violence against the government and threatening police in their speeches on May 1, which police contend led to protesters assaulting police officers, damaging property, and disrupting public order and safety. 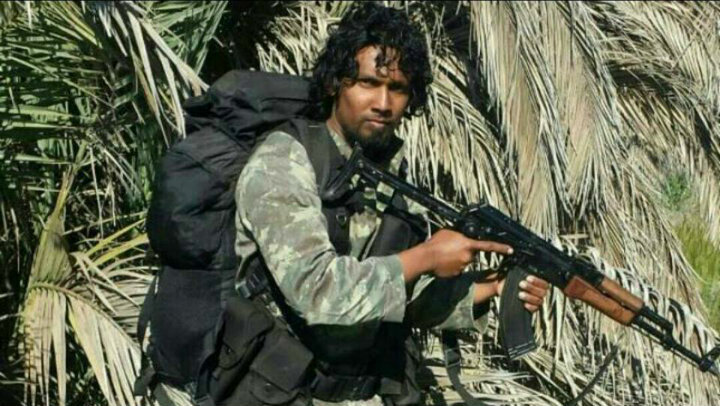 The High Court noted in the verdict in Ameen’s case that according to police an intelligence report and an audio recording of Ameen’s speech as evidence to the criminal court. The criminal court judge accepted the report but did not accept the CD with the recording. Police had said at the appeal hearing that the report did not have a verbatim transcript of Ameen’s speech. The criminal court judge had not determined whether Ameen had incited violence and encourage criminal offences before deciding that he posed a danger to society, the three-judge panel of the High Court ruled unanimously. In Ali Waheed and Imran’s cases, the High Court ruled that the criminal court order was lawful. The judges dismissed procedural issues raised in the appeal and noted that police do not have to submit enough evidence to prove guilt to be granted a request for extension of detention. However, in Ali Waheed’s case, judge Ezmirelda Zahir issued a dissenting opinion, while judges Ali Sameer and Abdulla Hameed issued the majority opinion to uphold the lower court order. Waheed saying that protesters must go home after freeing imprisoned ex-president Mohamed Nasheed was not sufficient to determine that he threatened police or posed a danger to society, Zahir noted in her dissenting ruling. 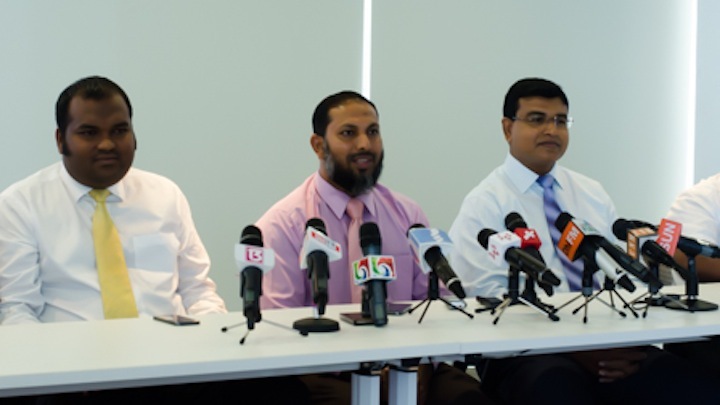 All three were members of the opposition ‘Maldivians against tyranny’ alliance’s steering committee, which organised the protest. Journalists were not allowed to observe the appeal hearings under a new rule that bars media from appeals of detention orders. The criminal court has meanwhile issued an arrest warrant for JP leader Gasim Ibrahim, who is currently out of the country. The business tycoon is accused of funding the May Day demonstration. The ruling coalition has accused the opposition alliance of plotting a violent overthrow of the government at an anti-government rally tomorrow. The ‘Maldivians against brutality’ coalition last night turned down last minute overtures for negotiations when President Abdulla Yameen appointed the tourism minister as his envoy for talks. “We will only sit down to negotiate with the the president of this country,” the Adhaalath Party president Sheikh Imran Abdulla told the press last night. Imran said tourism minister Ahmed Adeeb had sent him a letter seeking a time and place for negotiations, but declared that Adeeb is “unfit” to negotiate with the opposition, calling him “corrupt”, “a venial sinner” and “a criminal”. Adeeb has called Imran’s refusal to meet him “cowardly” and “effeminate” in a tweet this morning, dismissing the allegations of corruption and illicit connections with gangs as lies. Government ministers and ruling party MPs held a joint press conference this afternoon, and claimed the May Day protest will not be peaceful. The opposition is calling for an overthrow of an elected government and attempting to destabilise the country, Adeeb said today. “Our security forces are ready,” he said. He accused the Jumhooree Party (JP) leader Gasim Ibrahim of “funding” the May Day protest and hiring Imran under “a contract”. Imran is “playing the religious card” and inciting the public to rise up against the government, Adeeb said. President Yameen had maintained on Monday that he saw no reason to negotiate or resign in the face of the’May Day’ mass rally. 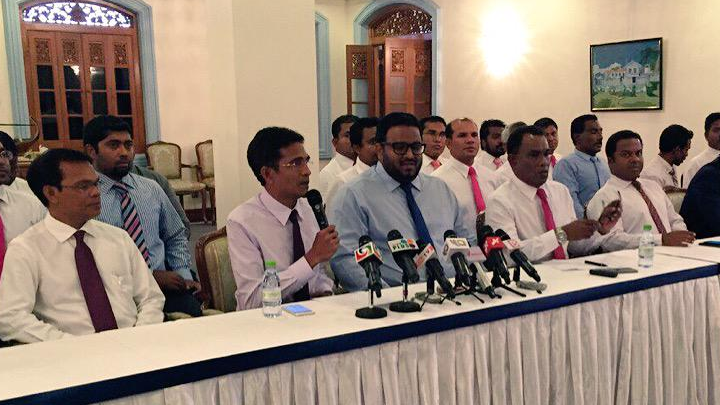 However, at a government ceremony the following night, Yameen said he has appointed Adeeb as his representative. 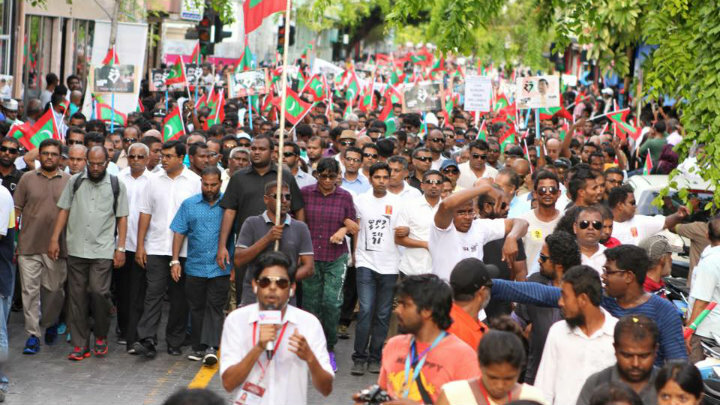 As the opposition build up to the mass rally continued and supporters from the atolls converged on Male’, Yameen has made daily public appearances this week. Speaking at a ceremony held yesterday to accept membership forms of opposition councillors from Shaviyani atoll, Yameen accused the opposition of sowing discord, destabilising the nation, and disrupting peace and security. 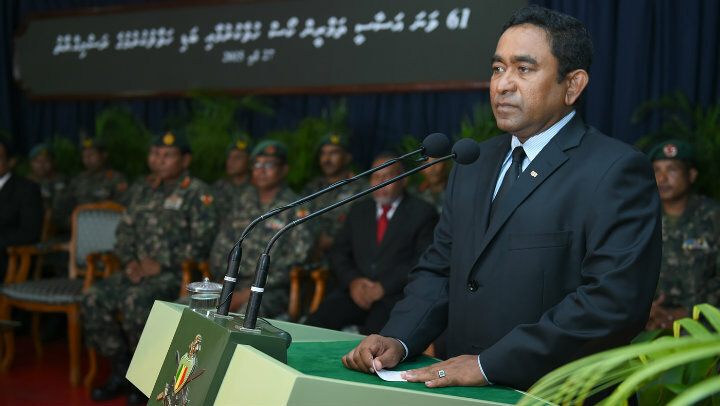 Unlike the opposition parties, Yameen said the PPM will not seek power at any cost and was “impatient” to develop the Maldives. The PPM will not torch buildings, assault civilians, and “commit atrocities,” he said. He reiterated the government’s stance of upholding the rule of law and enforcing court verdicts. At a live programme on opposition-aligned Raajje TV and Villa TV last night, opposition alliance leaders warned that the government will abolish political parties and establish a full-fledged “dictatorship” if tomorrow’s attempts to force president Yameen to come to the negotiating table fails. The chairperson of the main opposition Maldivian Democratic Party Ali Waheed dismissed claims by police that the opposition is planning a violent confrontation with police. The Maldivian people will be on the street “as one congregation” tomorrow. “I want to tell the public, don’t be afraid, the whole world is watching,” he said.